Are We From Different Planets? Bring together a group of people from diverse backgrounds and different generations and tell them to get along within a specific environment and accomplish numerous tasks. Sound like chaos? It is; but it’s also a modern work environment. Regardless of industry or location, there is never a shortage of issues in workplaces. Managers need to be great sleuths to discover whether the issues are caused by people, processes or structures. While processes and structures are relatively clear and easy to address, when the culprit is people, it can get messy because exploring the causes can reveal roots in personality, seniority, expertise, gender or age. Those from vastly different age groups can leave managers scratching their heads and considering if these people are from different planets. They don’t speak the same language, see anything remotely the same or agree on most topics. If you think this might be your workplace, compare it to the seven signs that problems are due to generation gaps and see how we helped resolve the issues. When employees do not speak the same language, communication breaks down, frustration rises and productivity slows. There is an obvious difference in lingo between generations and unfortunately each generation expects the others to understand what they mean because everybody “talks this way” – at least in their circle.After identifying the issue, we held a session on “generational lingo” and “acronym debunking” where the different generations took the lead. Learning for each group was significant and the amount of fun they had was incredible. Flash forward to present day and it is hard to believe they are the same group because communication has increased significantly as has productivity. A basic tenet of successful companies is effective and efficient work processes, yet each generation has a different idea of “how things should be done”. Older workers may lean toward “we have always done it that way” and younger workers may insist on change for better and faster processes.When generational problems cropped up around process, we saw this as an opportunity for a brainstorming session. It was a gold mine for new ideas, concepts and perspectives on how things could be done from each generational group. With this issue, professional facilitation is critical because it can become personal for individuals with perceived threats to job security, fear of change and other triggers. Walk the talk . . . but you talk funny!!! Impressive gadgets, devices and programs put information and resources at our finger tips. Generations differ greatly when they seek information, make decisions or solve problems. Some believe these activities should be reserved for the “who” (boss, supervisor, department head) while others think the group can take initiative to consult the “what” (internet, apps, data) for answers. This creates issues due to perceptions of hierarchy, respect and independence.We believe that employees of all ages perform best when consistency and predictability are present. Our work in these cases combined consultative management sessions with employee group meetings to establish when experts should be consulted and when smart mobs are preferable and allowable. All employees from these sessions are now clear on process and react quicker rather than debating personal preferences based in generational comfort. Throughout hiring and training, employees have definite expectations. Older generations have a long-term perspective – work long enough for a company and they will treat you right and reward you with a “gold watch at retirement.” Younger generations aren’t willing to wait that long and want a short probation followed by “tattoo artists are covered by the health plan”. 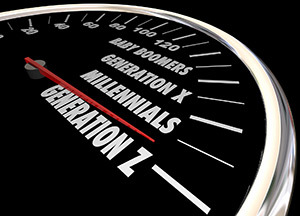 Because the younger guns have actively been shifting the trend of high seniority and endless loyalty, they have less tolerance for marginal bosses and companies and will not hesitate to find other opportunities.When faced with this issue, we created the opportunity for each generation to share their expectations and underlying rationales. The intent was not to get consensus or even agreement but to enhance understanding to decrease conflicts and learn a new appreciation for differences. We already know that different generations have different values. This can be significant in the workplace where certain values mean everything to one group, but very little to another. Take for example money – Baby Boomers see it as a way to take care of their families, Generation X prefer time with family over money and Generation Y want great balance with money and job flexibility. Workplace cultures shift over time due to the changing importance of values as the employee base gets younger.When dealing with value-based issues, we capitalized on the business’s willingness to be flexible and adaptive. We facilitated a one-day session where five different values were presented and each generation was given the opportunity to create five viable ways for employees have those needs met within the work environment. Now this company has clearer parameters and staff can create their preferred package. Each generation outwardly criticizes other generations for a “poor” work ethic. They each think their method of working is the best and preferred. The Boomers are workaholics and sacrificed for their families, the Gen X’s insist on work-life balance where jobs are just jobs, while Gen Y’s focus on life first and ask for work accommodations for balance.We saw this difference in work ethic judgement as an opportunity for gentle competition. Our game day with staff included posing various scenarios (sick kids, caring for elderly parents, two working parents, travelling, etc.) against the traditional Monday to Friday 9 to 5 work week. We asked what accommodations or allowances employees would like from the employer in order to work their full week’s hours. Everyone shared stories which shed light on the history of the employer’s rigid demands and complete lack of work flexibility to the progression to new innovations and openness to new options. The newer stories referenced options, choices and flexibility so family and work ethic could be balanced for self, kids, parents, grandparents and grandkids. When a workplace is displaying any of these seven signs, its evidence of a generation gap. If employees have shifted from showing these signs to outwardly complaining, things are escalating and intervention is needed. If managers are pointing fingers and feeling fed up with the generational blame games, it’s time for training to help managers balance the differences amongst their employees. Help the various generations in your workforce accept and share the differences. If your company is ready to tackle the generation topic and close the gap in your teams and departments, contact us today. We will get creative to build a training and coaching program that will give your managers the tools to supervise better. Learn more about our Building Better Bosses Program or Contact us at pam@thepossibilities.ca or 604-349-8660. This entry was posted by Pam Paquet and is filed under Business Assertiveness, Employee Training. You can follow any responses to this entry through the RSS 2.0 feed. Both comments and pings are currently closed.